I don't mind noting how "Virtually Breathless" I've been as I have been assessing our World and continuing to assess the on-going roadmap for #Outsiders. As the Obama Adminstration is coming to an end, it has been quite a journey to say the least. This afternoon, Judge Rosemary Collyer issued a final ruling in United States House of Representatives v. Burwell, the challenge to unilateral actions taken by the Administration under the Affordable Care Act (ACA). Judge Collyer ruled in favor of the House of Representatives and found that the Administration violated the Constitution in committing billions of dollars from the United States Treasury without the approval of Congress. The historic ruling reaffirms the foundational “power of the purse” that was given to the legislative branch by the Framers. 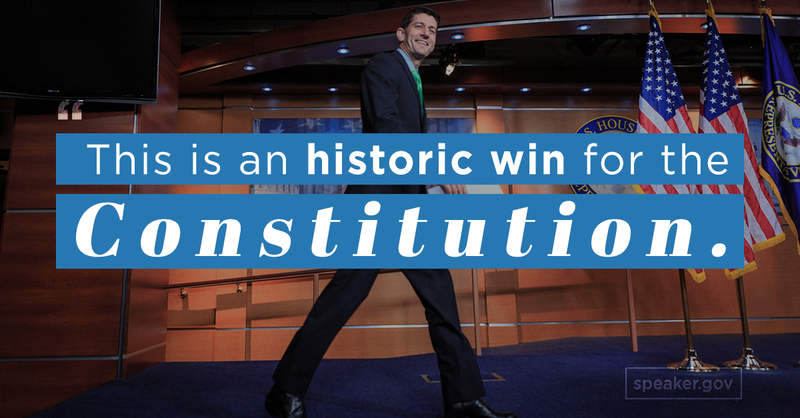 Today, we had a big win in our fight to restore the separation of powers under our Constitution. I wanted to tell you a bit about it. A federal court sided with the House in ruling that the administration unlawfully funded parts of Obamacare without a congressional approval. Time and again, this White House has gone too far. So we took up this fight to defend Article I of the Constitution. The fact is this: President’s don’t write laws. Congress does. We The People cannot accept an executive branch that acts outside the consent of the governed. Now our fight continues. Click here to learn more about this critical legal action. What is critical to observe is that this battle is not over by any stretch of the imagination--with the faith of millions on Obamacare hanging in the balance. Secretary of State John Kerry warned Wednesday that climate change is "the greatest threat that our planet has faced in modern history, in all of our history." Speaking at the University of Oxford in the UK, he said, "If you think current conflicts are all-consuming, imagine what happens when we add food shortages, water shortages, stronger storms, longer droughts, steady rises in sea levels, which are already being predicted, and entire countries swallowed by the sea." The Washington Examiner inserted its' own "take" on John Kerry's Speech which I found quite amusing. What I was not amused by is when I saw the reporting out of Afghanistan as one of the key roads was taken over by the Taliban. I found it further chilling as the Stretch of the so-called "Ring Road" between Kabul and Kandahar was known as Highway 1--Vietnam came to mind!! Beyond politics and the Environment, there were two areas of concern that was notable. One had to do with what Facebook is doing with determining what is "Trending" or "Not Trending" as it continues ot evolve into the true "World Town Square". Facebook's founder rejected the accusations--but the question of Facebook's dominance continues to be of concern. What I found interesting in my periodic forays is how I am not seeing some of the so-called "New Media" Players like Vox in my Personal Feeds. Vox, for instance, launched an exclusive Facebook-centric channel within the past few weeks. This is also as I have been assessing the State of the BBC as it continues onward with the White Paper that was uneviled by the British Culture Secretary--I am at a loss to explain how they could consider tinkering with a distinct British Institution that we here @ #Outsiders have featured periodically in our on-going development. I have been assessing the on-going state of the Tech Space this week as well--as I saw Symanteic, Autodesk and a number of other leading players initiate layoff proceedings. The anemic nature of earnings season (with the exception of Amazon) is a potential harbinger of challenging times before us especially as Europe continues to muddle through. I was quite amused when I saw this comment on the plight of Francois Hollande as he continue to languish in the polls, "....Mr. Hollande's smile is all that's left ..." What Emmanuel Marcon, the Economy Minister, is doing is also quite interesting as a third force in French politics since there is somewhat of a view that there is no left in France. Some may even contend that there is no Real Right in the United States.